Ghetto Santa is in the House (well more like a living room to be honest). 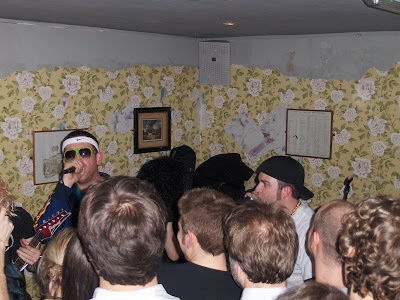 Thursday saw my second gig of the week - Ghetto Santa and friends at the Bourne and Hollingsworth in Central London. Damian who works in our Online Department is heading back to New Zealand so a farewell Ghetto Santa gig had to be done! So probably for the final time Ice Tray, 20 Pence, Freddie Van Helium, Slush and Drummer No. 8 (No.6 had already headed back to New Zealand and apparently No.7 had to enter rehab so couldn't make the gig) took to the stage in one of the smallest bars in Central London to entertain the crowd of work peeps and a few stragglers off the streets that had managed to fill ever nook and cranny of the bar to get their fill of the 'mad skillz' for the last time. And guest appearances were coming thick and fast half way through the set with Richard from Online delivering an excellent rap homage to Damian that sent the crowd wild. Following that outstanding performance, Ruth Anderson-Davis joined the rap-rock ensemble to provide some powerful vocals to 'Walk this Way'. After jumping around to a cover of House of Pain's classic and fighting for their right to party, Ghetto Santa left the stage for good. Hopefully like all other great bands a reunion tour will be announced in the future.